Buying Twitter Followers is Sketchy. Could Artificial Intelligence be the (Legit) Alternative? If you’re doing marketing for a smaller company, you’re very likely doing it all: juggling campaigns, content marketing, SEO, website updates, PR, social media, and whatever else comes along. You know your followers on platforms like Twitter are an important marketing opportunity, and you’re working hard to increase their numbers, in between all the other demands on your time. Fast tracking followers is a dilemma for any marketer, small business owner or social media manager. We’ve all heard how we can boost Twitter numbers by gaming the system through follow/unfollow bots or purchased Twitter accounts. Overnight, you’ve bought yourself a fan club and followers in the 1.5K range. Mission accomplished…if only it was actually worth anything. The problem is most of those Twitter followers are just fake accounts. And dummy accounts don’t buy things, won’t engage, and will never make you much of an influencer. True, they can temporarily boost your street cred with inflated follower numbers, but if it’s a masquerade, you’ll eventually be discovered. And you can compromise your business’s integrity, because there are easy ways to check if your followers are real. Buying followers also goes against Twitter’s terms of service, which could get you into hot water. This is where artificial intelligence – or AI – could make a difference. Building followers by sharing relevant content is the traditional, widely-recommended (and legitimate) way of increasing your audience. You share something compelling, and your followers help boost your numbers by liking, sharing or commenting about it to their networks. But the organic nature of this takes time and effort. Could AI speed things up? AI is known for processing large sets of data, which can help us understand a broad sense of what people are interested in, like a satellite map gives us a big picture of a certain geography. Twitter’s categories can capture sweeping interests like sports or technology. But Twitter is a platform made up of individuals. Each of us, as unique tweeters, want to read things geared to our specific interests. What if you could use AI to zero in on small chunks of data – as small as a single tweet – to understand what your followers are actually interested in, and share relevant content, on a regular basis, to each of those individual followers? Your followers would be much more likely to ‘like’, retweet, and reply. Primal has an AI solution that can look at a tweet from one of your followers and understand the meaning and context of the post. It can then find and recommend content based on what that person tweeted. This means when one of your followers tweets something related to your brand, Primal can find a relevant article and tweet it back in response. For example, if your follower tweeted “Friday looks like a great day to head out on the boat and catch some big ones”, Primal’s AI would understand how ‘boat’ is related to ‘catch’ and infer that your follower has a specific interest in fishing. It automatically sends a unique Twitter reply from you to that individual follower with a relevant article about fishing. Now you’re micro-targeting content, continually engaging your followers, and responding to their unique interests. That’s the key to individualized marketing. And using AI means you’re saving tons of time and effort. Your followers on Twitter want to be understood as individuals. Primal can provide individualized engagement at scale, creating authentic conversations, increasing loyalty, and organically growing your audience. Small Data or Big Data – Which Matters Most for AI? In the past year, we have seen countless headlines about how artificial intelligence (AI) will transform business. AI promises to provide insight into data and customers at a level of individualization never seen before. In response, many companies are scrambling to capture and store as much data as possible – but in doing so they might be increasing their exposure to data breaches, privacy violations, and hacks. Unfortunately, by taking a standard “machine learning only” approach to AI, we may not get far out of the starting blocks to achieve the vision of an AI solution that can understand data at a high level of fidelity. Many people assume that storing and analyzing large amounts of information (“big data”) through machine learning is the only way to take advantage of AI. But machine learning approaches can be actually be ineffective in understanding the meaning of text or the interests of individuals with any sort of specificity. Any company serious about AI needs to develop a solution that is both more targeted and more secure. 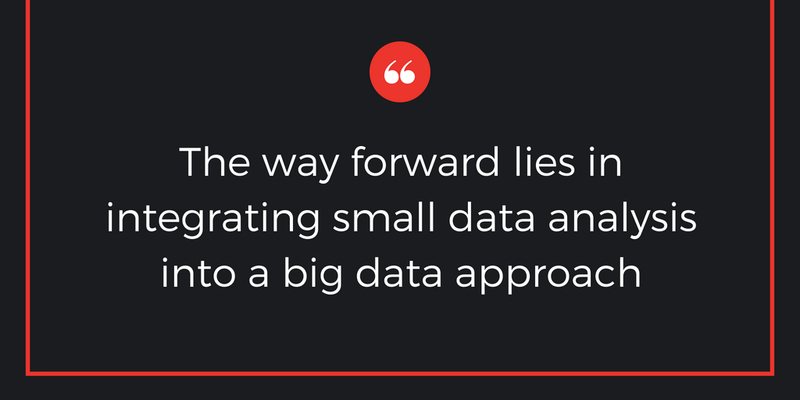 I believe the way forward lies in integrating small data analysis into a big data approach. Big data techniques can be expensive and ineffective at high levels of specificity: Just like satellite imagery provides a broad picture of geospatial data of a physical lake, today’s big data approaches do the same with data lakes. When statistical methods of AI are applied to a big data environment, the output is usually very generalized and lacks fidelity. For example, if a statistical model is looking at data about sports fans, it may see a pattern that groups people into categories such as “baseball enthusiast”, “football enthusiast”, etc. These broad categories lose sight of the fact that some users are actually a pitching enthusiast, or a statistics junkie, or a part-time umpire. Knowledge of these narrower topics would be extremely useful to advertisers of niche products, yet big data platforms today are very limited in identifying and exposing these higher fidelity interest categories. This is because processing and storage becomes increasingly more expensive and complex when analyzing large amounts of data to achieve higher levels of specificity. Integrating small data analysis is the key to making AI meaningful: Small data simply refers to the quantity of data available to train models. It’s often defined as the amount of information that can be processed by one computer, but it could be even smaller than that – a spreadsheet, a document, an article, or even as small as a social media post. 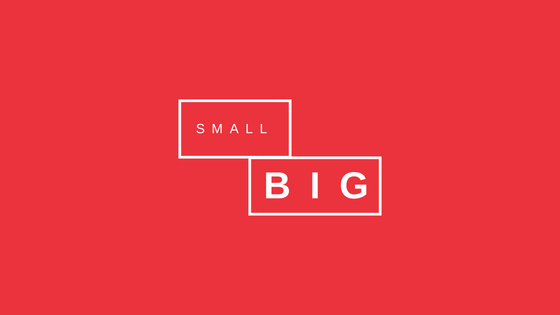 “Small data” can even be found within large data sets. Instead of applying statistical collaborative filtering techniques to a group of people to infer broad interests which are hit and miss, taking an approach that applies semantic or symbolic techniques to small data can look at an individual to understand exactly what they are interested in, no matter the level of specificity. For our baseball example, a small data approach would analyze the meaning and context of a person’s blog or social media post, and pick up the nuance between someone who likes statistics vs someone who is interested in pitching techniques. Small data approaches increase explainability and reduce potential for bias: One of the criticisms of AI is that it operates in a “black box”, where it can be difficult to determine the reasoning behind a specific output. Numerous organizations – including the National Institute of Standards and Technology (NIST) – have called for a more balanced and thoughtful approach to developing AI solutions, to ensure they are trustworthy and explainable. AI outputs based on small data are inherently easier to interpret by humans. AI systems which analyze and categorize users based on large data sets also have the risk of introducing biases over time – a problem that can be mitigated by integrating analysis of small data, which can serve as a self-correction against bias. The current model of statistical analysis of big data is ‘good enough’ for now, but not sustainable. For AI to really be relevant, efficient, and safe, big data must be balanced by a robust small data processing activity.